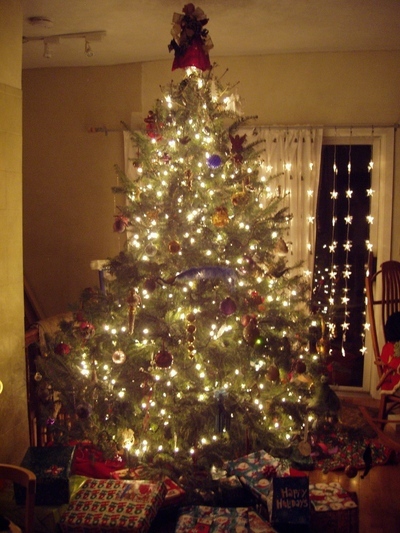 The City Record and Boston News-Letter Christmas Tree, December, 2006. I'd like to wish all of my readers a happy and joyous holiday season. City Record readers are invited to a Christmas Eve Service at First Parish Church in Dorchester (Unitarian Universalist), 6 P.M. This will be a singing and readings service in a classic New England meeting house. There will be instrumentalists: guitar with the choir on "What Child Is This", flute accompanying "Bring a Torch Jeanette Isabella" and a candlelit "Silent Night". There will be cookies and hot chocolate to follow and I will be giving tours talking about the history of First Parish Church. Children and welcome and encouraged. Did you know that Unitarians had an important role in popularizing Christmas in the mid-19th century? I'll be happy to tell you all about it, as well as Puritan attitudes towards Christmas. As is oft repeated at this time of year, Massachusetts Puritans outlawed Christmas celebrations in 1658, passing an order "For preventing disorders arising in several places within this jurisdiction, by reason of some still observing such festivals as were superstitiously kept in other countrys, it is therefore ordered by this Court and authority thereof, that whosoever shall be found observing any such day as Christmas or the like, either by forbearing of labour, feasting, or any other way, upon such accounts as aforesaid, every such person so offending shall pay for every such offence five shillings, as a fine to the county." Map to First Parish Church in Dorchester. 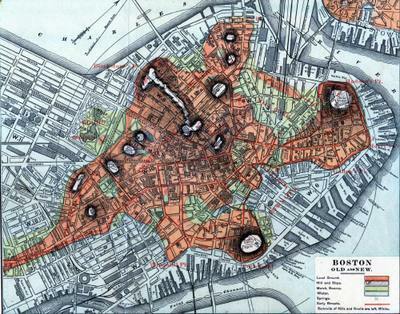 As a gift to my readers, I am making available the file to produce the map seen below, which is one of my favorite maps of downtown Boston from the late 1800s. The file is rather large (around 2 MB) but you can click and download it to your computer and print it or simply open it up in your favorite image viewer. The resolution is high enough to support some close viewing, so be sure to use the zoom function to discover long gone streets and buildings! I will post the file until my bandwidth is exhausted and if that happens, I will email the file to those requesting it. 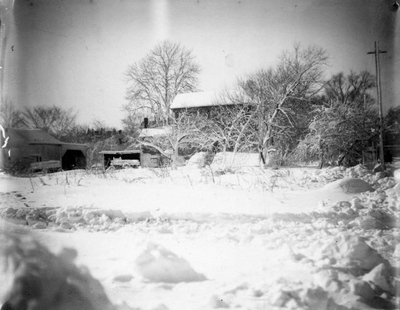 Unidentified Dorchester Buildings after a Snow Storm, c. 1900. Click to enlarge. (Image copyright The City Record and Boston News-Letter, all rights reserved). Entry into the snowfall prediction contest is now officially closed. There are tweve predictions, ranging from 41.8 inches, to 80 inches. A variety of guessing strategies were employed, including two entrants who used the approximate average annual snowfall as their prediction, but oddly enough came up with different numbers, 41.8 inches and 42 inches. The highest total was the first entry of 80 inches and there was a prediction of 51.5 inches from a reader in Alaska, where they presumably know something about snow. Good luck everyone, and thanks for entering! Now that the weather is apparently improving (as if it could get worse) the time is right to announce that I will begin leading Boston history and architecture walking tours soon. I've given hundreds of walking tours of Boston, and the walking tours will include Beacon Hill, the Back Bay, South End, North End, Dorchester--almost any neighborhood in Boston. I also do a walking tour for children through Beacon Hill based on the classic children's book Make Way for Ducklings--I have led hundreds of school children on this tour during the spring. Tours are generally 1.5 hours long, and the cost is $10 in advance for adults, $12 day of the tour. Children aged 6 and up are $5, under 6 are free. I am still working out a schedule, but in general tours will be an evening or two during the week, and on Saturdays. With sufficient notice and numbers other times can be worked out and custom tours are also possible. If you are interested, please email me. More information and a walking tour website will be coming soon. 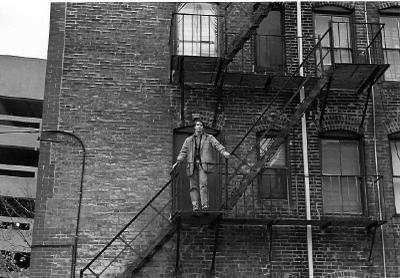 We won't be going up on any fire escapes (the building I'm in front of has since been torn down) but you will get my knowledge of Boston's architecture and history for the price of movie and some good exercise to boot. I hope you will join me. Before the Stony Brook became entirely covered for its run through Jamaica Plain in the late 19th century, it ran in an open channel until it reached the point shown in the picture above, where it went underground into the Boston sewer system. The massive grate which acted as a water filter collected all sorts of debris which needed to be cleaned off at regular intervals to prevent flooding during times of heavy rain, which is what the men above are doing. 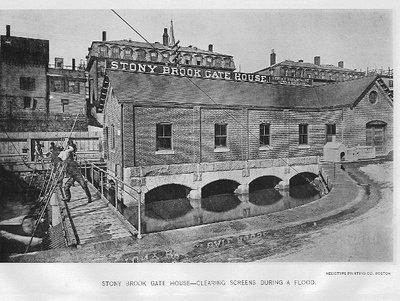 Before being diverted into the sewer, the Stony Brook would flood in a fairly regular basis, including a major flood in the mid-1880s which prompted the covering of the entire channel. I'm still trying to determine the location of the Stony Brook Gate House--does anyone have any thoughts? More about the Stony Brook sewer can be read here and here. You can see several animations of how the Stony Brook Sewer works. Don't worry, it isn't as disgusting as it sounds. p.s. I apologize for the poor scan. At 7:30 tonight there will be a re-enactment of the Boston Massacre. An unruly colonial mob will be meeting at the statue of Sam Adams (for authentic unruliness you may want to drink a Sam Adams) in front of Faneuil Hall to march up and confront the British soldiers in front of the Old Statehouse. <spoiler alert> Some of the mob will meet with an untimely demise. "The dead are Mr. Samuel Gray, killed on the spot, the ball entering his head and beating off a large portion of his skull. A mulatto man named Crispus Attucks, who was born in Framingham, but lately belonged to New Providence and was here in order to go for North Carolina, also killed instantly, two balls entering his breast, one of them in special goring the right lobe of the lungs and a great part of the liver most horribly. Mr. James Caldwell, mate of Capt. Morton's vessel, in like manner killed by two balls enterng his back. Mr. Samuel Maverick, a promising youth of seventeen years of age, son of the widow Maverick, and an apprentice to Mr. Greenwood, ivory-turner, mortally wounded; a ball went through his belly and was cut out at his back. He died the next morning. A lad named Christopher Monk, about seventeen years of age, an apprentice to Mr. Walker, shipwright, wounded; a ball entered his back about four inches above the left kidney near the spine and was cut out of the breast on the same side. Apprehended he will die. A lad named John Clark, about seventeen years of age, whose parents live at Medford, and an apprentice to Capt. 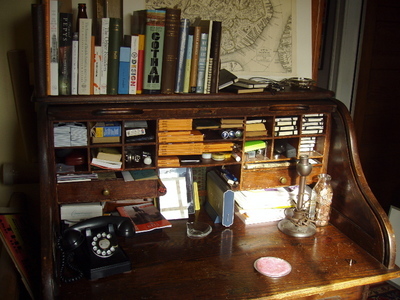 Samuel Howard of this town, wounded; a ball entered just above his groin and came out at his hip on the opposite side. Apprehended he will die. Mr. Edward Payne of this town, merchant, standing at his entry door received a ball in his arm which shatered some of the bones. Mr. John Green, tailor, coming up Leverett's Lane, received a ball just under his hip and lodged in the under part of his thigh, which was extracted. Mr. Robert Patterson, a seafaring man, who was the person that had his trousers shot through in Richardson's affair, wounded; a ball went through his right arm, and he suffered a great loss of blood. Mr. Patrick Carr, about thirty years of age, who worked with Mr. Field, leather breeches-maker in Queen Street, wounded; a ball entered near his hip and went out at his side. A lad named David Parker, an apprentice to Mr. Eddy, the wheelwright, wounded; a ball entered his thigh." "That it is the unanimous opinion of this meeting that the inhabitants and soldiery can no longer live together in safety; that nothing can rationally be expected to restore the peace of the town and prevent further blood and carnage, but the immediate removal of the troops; and that we therefore most fervently pray his Honour, that his power and influence may be exerted for their instant removal." "The wisdom and true policy of his majesty's council and Col. Dalrymple, the commander, appear in this measure. Two regiments in this populous city; and the inhabitants justly incensed: Those  of the neighboring towns actually under arms upon the first report of the massacre, and the signal only wanting to bring in a few hours to the gates of this city many thousands of our brave brethren in the the country deeply affected with our distresses, and to whom we are greatly obliged on this occasion---No one knows where this would have ended and what important consequences even to the whole British empire might have followed, which our moderation and loyalty upon so trying an occasion and our faith in the commander's assurances have happily prevented." A website on the massacre can be found here. Now I know all of you out there love the City Record and Boston News-Letter, so much so that it is probably a great disappointment when a day goes by without a new post. I've been meaning to talk to the City Record staff about the publication schedule but then they start asking questions about working conditions (see photo) and salaries so I tend to avoid the subject. But what would you say if I told you you can get another of fix of Massachusetts history, delivered in your email everyday? Now what if I told you it was free? Sound good? Then head over to the Mass Moments website, sponsored by the Massachusetts Foundation for the Humanties. Every day they serve up a Massachusetts history story which can be sent directly to you or read on their website. They even have them available for download as MP3s, technology that the City Record can only dream about. The subject matter covers the entire state, not just Boston, but I always think one should broaden one's horizons and this is an easy and fun way to do so. Three more stereoviews of Boston in the snow. 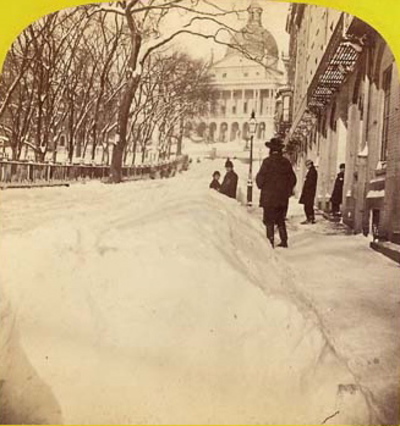 The first is a view up Winter Street towards Boston Common. The publisher of this stereoview had his office at 25 Winter Street. The second view is of the Public Garden on the Arlington Street side, the third is a view by Moulton along the Public Garden fence, likely along Charles Street. Click on the link below to see the other two photos. Stereoscope views were popular in the last half of the 19th century and several photographers in Boston produced them. The first image is a photograph by Heywood titled "Winter Scene--City Teams Carting Snow". It was published by Frank Rowell 25 Winter Street, Boston, Mass, U.S. Below is another Heywood view from the same series, looking up Park Street towards the Statehouse. In the Public Garden photo, the steeple of Arlington Street Church is visible in the upper left. I know many of my readers are from Dorchester and I hope all of you will participate in the upcoming Mass. Memories Road Show in Dorchester this March and May. If you're not from Dorchester, send the folks at the Massachusetts Studies Project an email and tell them your community wants to be next. Let them you know you read about it on the City Record and Boston News-Letter! When did your family arrive in Massachusetts? whether very recently or long ago. Photos are scanned onsite and the originals immediately returned to you. Attention visitors arriving via Google: we've changed our categories, which means that some of the Google links will take you to pages that no longer have the information you seek. This should all sort itself out as the new pages get spidered by Google. Thank you for your patience. If you don't need the information immediately, bookmark this site and come back in a few days. I have been making some changes to the configuration of the City Record and Boston News-Letter in anticipation of more frequent posting. I've cut down on the number of categories and added a little more information to the sidebar. I'm also designing a new masthead.